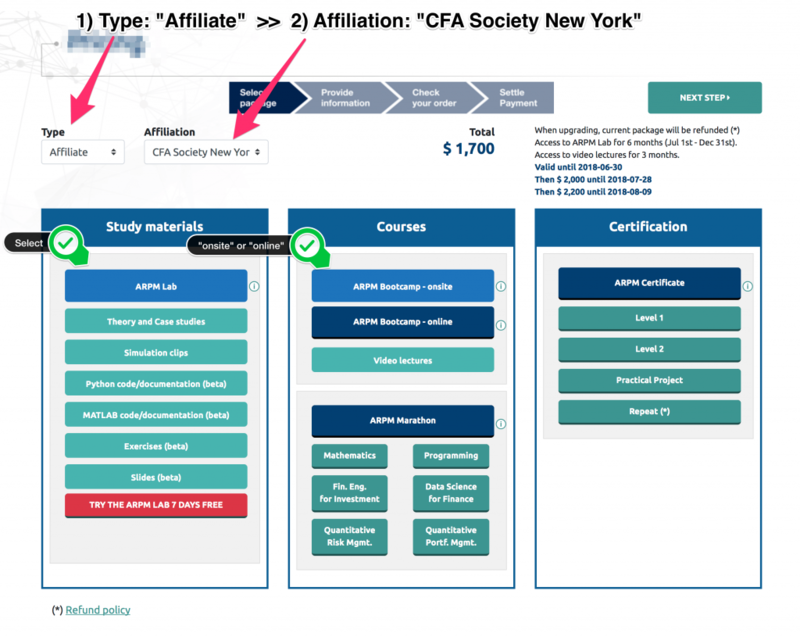 ‘Provide information’, place the code “CFANY2018” in the ‘How did you hear about our course/certificate?’ box. Click here to proceed to registration page. Upon enrolling in the ARPM Bootcamp, access to the ARPM Lab is provided for months. Social Mixer: mingle with ~500 practitioners and academics; chat, play, and share memories and photos. Group discounts and alumni discounts available. In operation since 2007, with thousands of alumni globally including industry leaders and academics. Data science and machine learning; market, credit & liquidity risk management; factor modeling, portfolio construction, and more. Empowers avid learners with background in data science, engineering, computer science, physics and mathematics to gain the deep technical knowledge necessary to operate across the complex world of quantitative trading, asset management, and risk management. Networking: Gala Dinner, Social Mixer, and other events with industry leaders, renowned academics and the 400+ fellow attendees. You are entitled to an affiliate discount. On the left side of the registration page, select “Affiliates” before moving on to the next step. In the discount code box, enter “CFANY2017” to pay the society discounted rate of $1,800 (vs. the regular rate of $2,300)..